AARON McEneff is 'delighted' to secure his move to Shamrock Rovers and claims Tallaght Stadium is his favourite place to play. 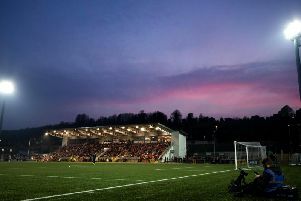 The much sought after midfielder turned down offers from elsewhere to join the Hoops, including a new and improved offer from Derry City but the Dubliners' impressive venue seems to have played its part in his decision. It's a major coup for the Dubliners as McEneff has been one of Derry City's best players in recent seasons, scoring 19 league goals in his last two campaigns and finishing as the club's top goalscorer last year. “I’m very happy signing for Shamrock Rovers; obviously it’s a massive club," said McEneff. "I’m delighted to get things done and I’m looking forward to the new season. "Tallaght Stadium is my favourite place to play; whenever I was at Derry I loved coming down to play here because the pitch is always good, the facilities are brilliant and I loved coming down here because it gave me an excitement to go out and play a game of football. Rovers boss, Stephen Bradley was delighted to officially announce the player's signing claiming the chance to sign a player of McEneff's quality was too good to turn down.